*** EDIT 09/05/2014 *** FleaFPGA is now available to purchase as a fully-assembled and tested product. 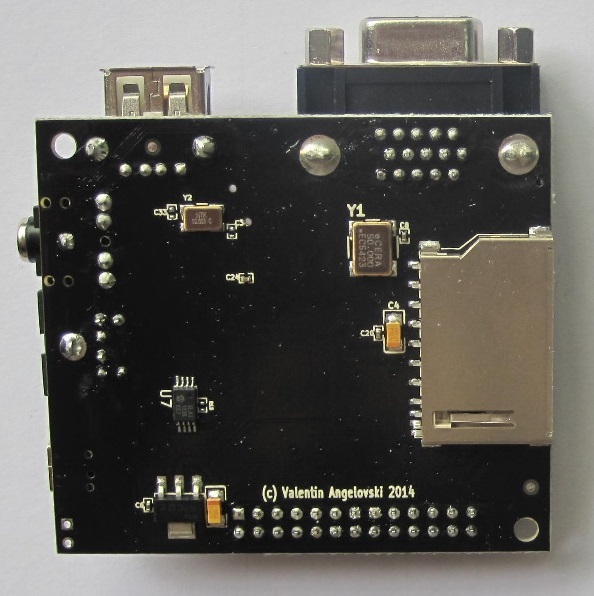 I am happy to finally announce a limited production run of assembled and tested FleaFPGA boards. This is intended to begin on March 1st. FleaFPGA unit pricing will be set at USD$65 plus delivery. Deliveries will begin from late March onwards. Given the expected demand, these will probably be hand-built by me. Although it is not expected, in the event that I do receive enough requests from interested people (say, 100) then I will look at other options to move this project forward ie. getting the boards made in an assembly house etc. In that case, I would be aiming for USD$60 per board. Over the next few days, I will be follow-up on received email requests for FleaFPGA availability. Of course, any new email requests between now and the above starting date are welcome. *Edited 13/02/2014 Quantity numbers revised. First off, many thanks to those who recently discovered my FleaFPGA project on Hackaday and expressed their interest in it via email. I will endeavour to reply to all the enquiries later today, so please bear with me. While we're not yet at our ultimate goal of ~100 systems, I can say we are off to a healthy start. Will reveal more details later. There will be further updates - watch this space! I have decided to added an extra dimension to our production announcement: In addition to the FleaFPGA boards ordered within this batch, I will also make available only eight (8) 'special-edition' FleaFPGA boards, personally signed on the PCB underside by the creator himself (i.e. me :-) at a cost of USD$120 each plus delivery. These particular system boards will be considered part of the final production count. Some folk are probably going to be disappointed, but this will be the one and only time I will offer this for FleaFPGA in it's current form. Just a few small updates to mention here..
- Thanks for all the interest received thus far for my FleaFPGA project. I can safely say at this point that it was more than had been expected. We are nearly at half our run of 100 boards, though production will proceed regardless of final numbers. Among the counted pre-orders thus far included one 'special Edition' signed FleaFPGA (Many Thanks!). - There was some concerns raised over the use of the CH376 as a proper USB Host controller, mainly due to poor technical documentation etc. Well, I decided to do something about that Please read up on my efforts to deduce the true capabilities of the CH376 from the vendor-supplied HID example demo source. PS: Only five more days to go until the production plan is put into action.. Those of you who haven't yet registered their interest in a FleaFPGA (but would like to do so) please send me an email. Thanks again! Today is the last day to register interest in securing a FleaFPGA from our initial production run. Although we did not achieve our goal for a run of 100 boards (we only received interest for slightly less than 50), production will go ahead regardless. In the past week or so, I have been making a few incremental improvements to the current FleaFPGA design spec to further enhance the platform (and stepped up the PCB Revision to v2.5 from v2.4). Will reveal more details around this later on. I will now ask those who have pledged their support for my project, to do so by way of confirmation payment. I will also commence plans towards production. Thanks again! Our pre-ordering period for FleaFPGA has now passed. Thankyou to those of you who have chosen to put their support behind my FleaFPGA project. I will now focus on getting these boards manufactured and shipped. Please check here for further news as I will be providing status updates around this. Thanks again! 1.) All parts for the FleaFPGA production run have been ordered and awaiting delivery to the factory for assembly. There was a small delay in sourcing alternative parts due to vendors running out of stock on selected component items, but otherwise this process went smoothly. 2.) I have modified a current v2.4 prototype board to match the newest v2.5 PCB design (ie. what I will be ultimately shipping). Most significant addition to v2.5 was the serial SRAM and so it’s function needed to be tested fully. 3.) Given these boards are being built thousands of miles away from me, I am currently in the end-stages of preparing a test plan for the FleaFPGA boards to be functionally tested once they come off the assembly line. I hope to have this ready by this Tuesday ahead of the actual build. 4.) Apart from the tiny delay due to parts sourcing issues, I am largely on-track to have production boards roll off the assembly line by the end of March. This means (assuming no holdups from our local customs office), I should be in a position to ship these boards from around mid-April onward as quoted. 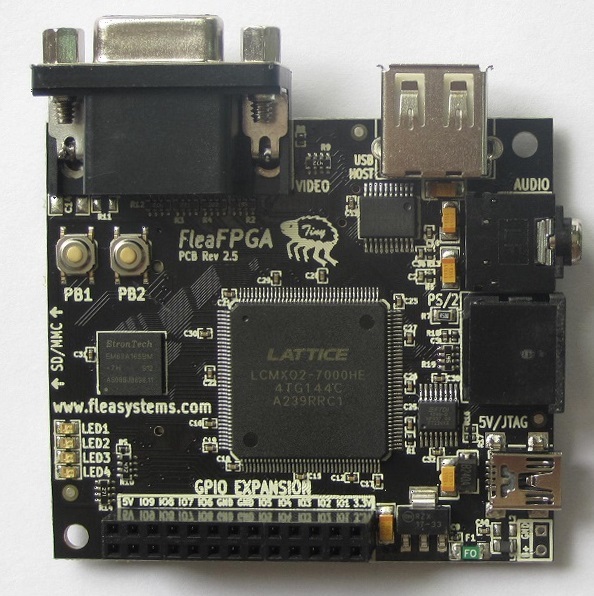 Another quick news update: All essential components as required for the FleaFPGA run have been supplied to the factory and final assembly of the boards has already begun! Assuming no problems with assembly and testing, these will hopefully leave the factory around mid/late next week. More to follow.. I have some very good news! I have received and tested the initial production run of FleaFPGA boards, and the vast majority have all passed their functional testing! To those of you who have pre-ordered and patiently waited for a FleaFPGA board I am pleased to inform you that the wait is very nearly over.. I will now prepare immediate delivery of all pre-ordered FleaFPGA boards. Please keep an eye out for related confirmation emails. Thanks again!